Walking in Southern England is a delightful way to experience the rolling hills and expanses of farmland pasture that are typical of the English countryside. You can wind your way through historical landscapes and ancient woodlands to discover old churches, abbeys and inns. You can escape to the coast and experience the heights of the spectacular white chalk clifftops with rewarding views across to the Isle of Wight, the English Channel and beyond. A walking holiday on the Cotswold Way or the South Downs Way is a relaxing way to enjoy the hidden treasures of Southern England. The Cotswold Way is a National Trail starting in the traditional market town of Chipping Campden and winds its way to the famous city of Bath with extensive Roman archaeology, Roman baths and hot springs. The walking is peaceful, taking you on countryside lanes and paths, along escarpments and through commons and woodlands. Along the way there is a myriad of historical sites to explore as you pass through Medieval wool towns, Neolithic Burial Barrows and ancient abbeys and churches. There are warm and welcoming villages and towns that are home to charming inns and buildings crafted from rich Cotswold stone. A walking holiday on the South Downs Way takes you on a journey across the South of England, from the historical city of Winchester to finish on the dramatic cliffs of Beachy Head before descending into Eastbourne. Follow in the footsteps of ancient travellers on trade routes that date back to the Stone Age as you pass over expansive fields and the landscape of the downs. Take the opportunity along the way to visit ancient hill forts, take in the magnificent views of the Seven Sisters and simply enjoy the diverse array of wild flowers and butterflies. The Peddars Way and Norfolk Coast path is a straightforward, flat walk suitable for most abilities; there are just a few longer days on the Peddars Way. It would make a great first long distance walk as the route is very well signposted and easy to follow. There is plenty of interest along the way, from beautiful beaches, historic buildings and nature reserves to Victorian seaside towns, restaurants and cafes. A relaxed, peaceful walk through some of the nicest parts of Norfolk. The South West Coast path is England’s longest waymarked long-distance footpath and National Trail. The trail covers a total of 630 miles along the spectacular coast of Devon, Cornwall and Dorset. We offer eight holidays on the best parts of the route. From the start of the route in north Devon we have Minehead to Westward Ho! This is followed by two holidays in north Cornwall, from Westward Ho! to Padstow and from Padstow to St Ives. Then in south and west Cornwall we have three holidays covering St Ives to Penzance, Penzance to Falmouth and Falmouth to Plymouth. In south Devon we can offer you Exmouth to Lyme Regis and in Dorset we have Lyme Regis to Poole, taking you to the end of the full route. Each walk is worth doing in its own right or you can put two or more together if you have the time! The route is challenging, there are no big mountains but there is plenty of climbing and descending through all the coves that line the route. It can be rocky underfoot in places too but the route is well waymarked and easy to navigate. The many beautiful beaches, fascinating history, fishing villages and imposing cliffs make this an unforgettable walk. This is a delightful route that explores the picturesque English villages of the Cotswolds, roaming though a beautiful green landscape of rolling hills and ancient woodland. The trail ends in the World Heritage City of Bath. The Peddars Way and the Norfolk Coast Path combine to make a very accessible 93 mile walk, taking in the best parts of the Norfolk countryside and coastline. The Peddars Way is an ancient road dating back to the Bronze Age, then developed into a military route in Roman times and later used by pilgrims during the 15th century. The route is straight and flat following mostly green lanes and tracks with some interesting archaeological sites along the way. The Norfolk Coast Path follows the coast from Hunstanton to Cromer for 45 miles. With interesting Victorian seaside towns, fishing villages, beautiful beaches and nature reserves with a wealth of bird life, there is plenty to see along the coast. An easy-to-follow gentle walk through the Norfolk countryside. Lovely coastal villages and interesting historical buildings. Lots of birdlife and internationally recognised wildlife reserves. From the historic market town of Winchester the route follows the rolling countryside of the South Downs to the dramatic chalk cliffs of Beachy Head on the English Channel. The South Downs Way starts at the ancient and historic city of Winchester and follows the northern crest of the chalk escarpment of the South Downs, all the way to the sea. Stretching for 100 miles through England’s newest National Park, to the seaside town of Eastbourne, this walking holiday offers a fabulous taste of this lovely rural area, with spectacular views, expansive fields, beautiful woodlands, picturesque villages and huge amounts of history. The South Downs Way is well marked and easy to follow. It is used by horses and cyclists, so is very accessible, with almost no stiles. It links many ancient and historic tracks, used by travellers and traders since the Stone Age. It is one of the easiest National Trails, with few steep sections, apart from when the route drops down into river valleys, and for the descent to overnight stays in the pretty towns, villages and farms along the way. Although seldom exceeding 250m (820ft), this walking holiday gives a great feeling of space, and a sense of being ‘on top of the world’. Passing iron age hill forts, the spectacular chalk formations of The Devil’s Dyke and the Seven Sisters and rolling countryside with fields of grazing sheep, corn and wild flowers, the South Downs Way offers a magnificent sense of solitude, centuries of history and a cross section of one of the most beautiful parts of southern England. Our Dorset holidays let you explore sections of the Jurassic Coast where you might even find some fossils. The footpath takes in tiny fishing villages, rocky headlands, lively resorts and golden surf-washed beaches. The South West Coast path is England’s longest waymarked long-distance footpath and National Trail. The area is full of interesting wildlife and birdlife, and you may even spot dolphins and seals. Our Dorset holiday covers a stunning section of the path with amazing geology and scenery as you walk along the Jurassic Coast World Heritage Site. Near Weymouth there is a choice of routes, either stay on the coast or follow the South Dorset Ridgeway through one of the UK’s most significant ancient ceremonial landscapes. Walk along the Jurassic Coast, England's first World Heritage Site. Spectacular clifftop walking between idyllic sandy beaches. See amazing geology and scenery. Stay in delightful seaside towns and old fishing villages. Amazing clifftop views of the wild Atlantic coast, tiny fishing villages and night stops in the popular towns of Padstow, St Ives, Port Isaac and Tintagel. 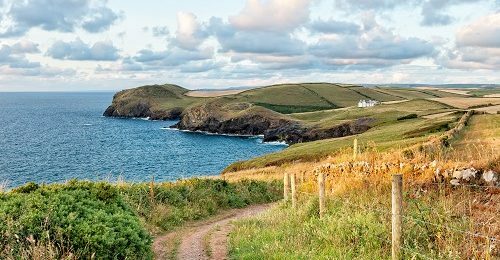 The North Cornwall Coast Path is a must-do walk along a breath-taking stretch of coastline. The South West Coast path is England’s longest waymarked long-distance footpath and National Trail. The area is full of interesting wildlife and birdlife, and you may even spot dolphins and seals. There are lots of historical points you pass along this route and museums highlighting North Cornwall’s hidden past. The North Cornwall Coast Path takes in tiny fishing villages, rocky headlands, remote coastal landscapes and golden surf-washed beaches. We offer two sections that cover North Cornwall along the South West Coast Path (SWCP) National Trail. These sections pass through a mixture of idyllic coastal villages with the most rewarding views over clifftops and beaches. Our holidays along this section of the South West Coast Path include stopover nights in the popular towns of Padstow, St Ives, Port Isaac and Tintagel. Walk along one of Britain's most dramatic coastlines. Explore the exquisite tastes behind Padstow’s delightful seafood restaurants. Unspoilt countryside with abundant wildlife. Discover the history of Cornwall. Enjoy the highest cliffs in England, beautiful beaches, a wealth of flora and fauna and a glimpse into Cornwall’s fascinating history of seafaring and smugglers. This part of the South West Coast Path allows you to explore the north Devon Coastline with stopover nights in the popular towns of Minehead, Lynmouth and Woolacombe. The South West Coast path is England’s longest waymarked long-distance footpath and National Trail. The area is full of interesting wildlife and birdlife, and you may even spot dolphins and seals. Our north Devon holidays include stopover nights in the popular towns of Minehead, Lynmouth and Ilfracombe. There is diverse scenery on this section of the South West Coast Path. The first stretch takes you over some of the highest cliffs in England where the expanse of Exmoor meets the sea. There are extensive views inland and north across the Bristol Channel with the coast of Wales as the backdrop. You will pass through coastal woodland and see vast sandy beaches popular with surfers. In contrast is the large estuary of the Taw and Torridge rivers, flanked by sand dunes and marshland, where the path follows the former railway and later the estuary. This is an area valued for its birdlife and incorporates the Tarka Trail, a series of footpaths following the route taken by Tarka the Otter in the book by Henry Williamson. Walk along one of Britain's most dramatic and longest coastlines. The ‘Great Hangman’ is the highest point on the South West Coastal path. Enjoy a walk that takes in beautiful beaches, a wealth of flora and fauna and a glimpse into Cornwall’s fascinating history of seafaring and smugglers. The South West Coast path takes you around the most southerly coastline of Britain with stopover nights in the popular towns of St Ives, Penzance, Falmouth and Plymouth. The South West Coast path is England’s longest waymarked long-distance footpath and National Trail. The area is full of interesting flora and fauna, and you may even see dolphins and seals. The path follows in the footpaths used by coastguards and officers back in the 19th century who would have been on watch for smugglers. There are lots of historical points you pass along the route and museums highlighting Cornwall’s hidden past. Our south and west Cornwall holidays include stopover nights in the popular towns of St Ives, Penzance, Falmouth and Plymouth. The Cornwall Coast Path takes in tiny fishing villages, rocky headlands, lively resorts and golden surf-washed beaches. We offer three sections that cover the south and west of Cornwall along the South West Coast Path (SWCP) National Trail. These sections pass through a mixture of idyllic coastal villages with the most rewarding views over clifftops and beaches. Walk along a section of Britain's most dramatic coastline. Explore the history of Cornwall. Our South Devon holidays let you explore sections of the Jurassic Coast where you can even have a go at fossil hunting. The footpath takes in tiny fishing villages, rocky headlands, lively resorts and golden surf-washed beaches. The South West Coast Path is England’s longest waymarked long-distance footpath and a National Trail. Our South Devon holidays let you explore sections of the Jurassic Coast where you can even have a go at fossil hunting. The footpath takes in tiny fishing villages, rocky headlands, lively resorts and golden surf-washed beaches. The area is full of interesting flora and fauna. You may even see dolphins and seals if you’re lucky. Walking from Exmouth to Lyme Regis you pass through some idyllic coastal villages with the most rewarding views from clifftops and over the coastline. Explore the history of Devon. The Thames Path National Trail follows the greatest river in England for 184 miles (294 Km) from its trickling source at a spring in the rural Cotswolds to its vast presence at the Thames Barrier, just a few miles before it meets the sea. This route boasts tranquil water meadows, fabulous wildlife and wildflowers, quaint villages, historic market towns, gothic towers, cities and many locks. This river, once vital to trade, helped grow England’s capital to the size it is. As railways and roads took over, this great trading route started to fall into decline. Discussions started back in the 1930s about how they could put the old Thames tow path to use but it was not until after further discussions, and with the help of many groups of people (including the Ramblers Association and the River Thames Society), that 16 miles of new tow path was built and the Thames Path became a fully opened National Trail in 1996. Always so helpful when contacting you. Great accommodation. Very personal service. Feel I can phone with any concerns and you are helpful. Don’t feel like a number. We enjoyed the hike and liked the variation of guest houses and hotels, very friendly people, very well received. We enjoyed the luxury of the room with tea and coffee, etc, excellent packed lunches and our luggage transport. We are impressed by the quality of the organisation of the trip and the services rendered.